Carpets remain the most popular type of flooring in the UK and with hundreds of styles, colours and textures available to choose from, there’s something for everyone. Carpets are most often used in rooms where comfort is highly desirable such as bedrooms and living areas. Other rooms such as kitchens and bathrooms now tend to be laminate or tiled. To maximise comfort, most carpets are now fitted with underlay. 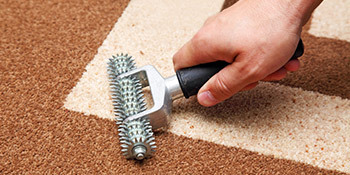 Both underlay and carpet are fixed to the floor with nails, tack strips, adhesives and metal stair rods. Why choose a local carpet fitter? Your carpet will often be chosen after you’ve decided on a colour scheme for the room. With a range of colours and designs to choose from you’ll be able to find something that matches well. By choosing a local carpet fitter you’ll be supporting your area’s business and you’ll probably see a much cheaper rate than national suppliers. Of course, one of the main problems with this is not knowing who will carry out a great job. The chance of botched work is eliminated with our service. We only have vetted fitters on our books, each independently checked and referees verified. Whether it’s just one room or the whole house, carpet prices vary from style to style and contractor to contractor. To truly trust that you’ve received the best possible price it’s important to compare quotes from a range of fitters. To receive up to four FREE quotes from local, vetted and reputable carpet fitters in your area, just complete our quick form. All quotes are under no obligation and the ultimate choice is always yours. Project: Spare bedroom has three small areas of carpet that have been ripped by pet. Need repairing before leaving tenancy. Project: Have a small bit of thread that’s been pulled out my a drill bit while fitting a door stop and need this repaired please. Project: Repair to top layer of carpet which has been singed due to hot iron falling on to it. Project: NEED TO REPAIR IRON BURN IN MY BED ROOM CARPET.